Antiseptic, soothing and relaxing. This particular sandalwood essential oil is obtained from a species found growing in New Caledonia that is closely related to the sandalwood trees native to India. The essential oil distilled from the heartwood has a sweet, rich, warm, woody aroma with balsamic and slightly smoky undertones that makes it an ideal substitute to the much more costly Indian sandalwood. Not only is it more cost effective, but it also has the added benefit that it is from sustainable sources. Used since ancient times as an aid to meditation, it will come as no surprise that sandalwood essential oils have a powerful relaxant effect that also helps increase focus and clarity. This makes it ideal for soothing stress and anxiousness, and really helps you get a good night’s sleep. 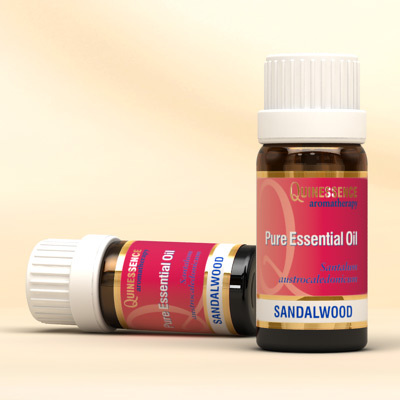 Sandalwood oil also has anti-spasmodic and expectorant properties that make it a great choice to bring relief to dry, tickly, persistent coughs. Sandalwood is highly prized in skin care for its anti-aging qualities; it reduces scars and blemishes, moisturizes dry and flaky skin, soothes and cools rashes, itching and irritation, and balances an oily complexion due to its gentle astringent action. Since it is also a very effective antiseptic, sandalwood oil can be beneficial for acne treatments where it soothes, heals, and protects against infection. It has been used traditionally for urinary infections and digestive problems.